in grammar. In many languages, words or parts of words are arranged in formally similar sets consisting of a root, or base, and various affixes. Thus walking, walks, walker have in common the root walk and the affixes -ing, -s, and -er. (1) In conjugate algae, a special sexual process that involves the merging of the contents of two externally similar vegetative cells. (2) In infusorians, an exchange of sexual nuclei and their subsequent fusion by pairs, during which pairs of infusorians draw near one another on the mouth side. During fusion the macronucleus (vegetative nucleus) is gradually destroyed and the micronucleus (sexual nucleus) divides twice by meiosis. Next, three nuclei are destroyed while one divides again; each of its halves is exchanged for the half-nucleus of its partner—that is, they merge to form a syncaryon, restoring a double set of chromosomes. The syncaryon then divides; a portion of the products of its division becomes a macronucleus, and the other part becomes a micronucleus (see Figure 1). Sometimes a small amount of cytoplasm is transferred in the process from one cell to the other. The process of conjugation in various infusorians may differ sharply in its details. (3) In bacteria, a means of transferring genetic material from one bacterial cell to another. Two bacteria unite by means of a delicate bridge, across which a piece of a strand of deoxyribonucleic acid (DNA) is transferred from one cell (the donor) to the other (the recipient). The genetic properties of the recipient change according to the amount of genetic information in the transferred piece of DNA. (4) Chromosomal conjugation is a temporary pairing of homologous chromosomes during which there may be an exchange of homologous parts and after which the chromosomes separate. the scheme of the inflectional forms of a verb. In the paradigmatics of a language, conjugation is in contrast to declension. Conjugational forms express the categories of person, number, gender, tense, and mood. In Russian philology, aspectual forms are traditionally not included in the conjugational system, since in Russian and the other Slavic languages the category of aspect is autonomous in relation to the category of tense. In this respect, the Slavic languages differ from languages with a single system of aspectual and temporal forms, for example, ancient Greek and Latin. Conjugational forms may be synthetic or analytic. Conjugational systems in different languages vary in terms of the number of tenses and moods they contain. Russian has three tenses and three moods, ancient Greek seven tenses and four moods; some North American Indian languages, such as Hopi, have more than nine moods. Conjugated verb forms express the categories of person, number, and so on, and also the nature of the syntactic bonds between the verbal predicate and the subject and object. For example, Hungarian has both object-related and nonobject-related conjugations: láto-k (“I see”), láto-m (“I see [this specific object]”). In some languages with an ergative structure, the verbs have two paradigms relating to the category of person: an ergative paradigm and an absolute paradigm. Conjugational systems change over the course of history. For example, the conjugational system of modern Russian is a simplified form of the more complex conjugational system of Old Russian, in which the categories of tense and aspect had not yet become completely separated. The tense system of Old Russian contained a present tense, four past tenses and, probably, two future tenses. In all tenses the verbs differed according to person. There were three paradigms for the category of number: singular, plural, and dual. Some scholars define conjugation as the aggregate of all verbal forms, including nominal forms. Borkovskii, V. I., and P. S. Kuznetsov. Istoricheskaia grammatika russkogo iazyka. Moscow, 1963. Grammatika sovremennogo russkogo literaturnogo iazyka. Moscow, 1970. Vinogradov, V. V. Russkii iazyk: Grammaticheskoe uchenie o slove, 2nd ed. Moscow, 1972. 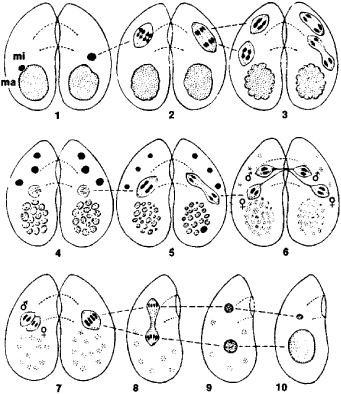 Sexual reproduction by fusion of two protoplasts in certain thallophytes to form a zygote. Sexual reproduction by temporary union of cells with exchange of nuclear material between two individuals, principally ciliate protozoans. A process involving contact between two bacterial cells during which genetic material is passed from one cell to the other. 13] Inhibiting conjugation has been suggested as a strategy to prevent or slow the spread of antibiotic resistance genes to dangerous pathogens. HRPc purification steps were visualized by SDS-PAgE at 12% and then concentrated and dialyzed as cited above in conjugation buffer for GA pH 6. Since the corresponding antiparticles should possess a Compton radius like their particle counterparts, the C' operator is not a valid charge conjugation operator. The ability to deliver services, such as Stable Isotope Labeling, Protein Biotinylation, Fluorescent labeling in vitro, Fluorescent tagged protein in vivo and Enzyme/Antibody conjugation shortens timelines and results in a more cost effective solution to clients. This technology naturally complements Almac's expertise in peptide and small molecule manufacturing, and can also be allied to its world-class protein conjugation technology offerings. Ambrx offers a novel approach to allow creation of site-specific and highly stable conjugations that have the potential to further optimize drug delivery to tumor cells. When drugs are connected with Novozymes's Recombumin Flex recombinant human albumin (rAlbumin) by means of conjugation, their pharmacokinetic and pharmacodynamic properties can be significantly improved, Novozymes stated. While the chance to hear the pronunciation of a native Italian speaker is a plus, the complete absence of any written or visual conjugation, definition, or contextualization is certainly a drawback. Another example is that she gives the impression that every time a verb in the suffix conjugation is preceded by a waw, it must be translated by an English future tense, i.